We’d love your help. Let us know what’s wrong with this preview of Guillaume by Prue Batten. Guillaume of Anjou, formerly an archer fighting with other Angevins in the Third Crusade, is now the manager of a successful merchant house. In his new position, he unwittingly steps into and out of the shadowed world of The Church – powerful and moneyed. "With her customary elegant use of language, Prue Batten plunges us effortlessly into the mercantile houses, twisted alleys and secret shadowy tunnels of medieval Europe. 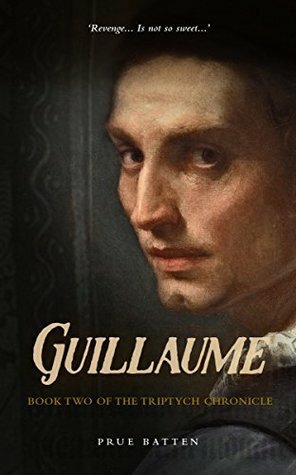 Guillaume is a riveting tale of twelfth century trade, treachery and intrigue." Matthew Harffy, bestselling author of The Bernicia Chronicles. To ask other readers questions about Guillaume, please sign up. From the start of the book you can tell someone is either out to get Guillaume or destroy the business he helps run but you are kept guessing as to which and the This is my first venture into the work of Prue Batten and I can safely say I was impressed! We are proud to announce that GUILLAUME by Prue Batten is a B.R.A.G.Medallion Honoree. This tells a reader that this book is well worth their time and money! A book that you won't want to set down. Excellent reading, with plot twists that are unexpected. Definitely recommend this book and now plan to read the first in the series. Prue was born in Australia and studied history and politics at the University of Tasmania. She has worked as a hotel cleaner, a cosmetician in a major department store, and a bookseller. But most properly, she has been a journalist/researcher for the Australian Broadcasting Corporation where she met her husband, who was also a journalist, subsequently a media executive, and is now a communications Prue was born in Australia and studied history and politics at the University of Tasmania. She has worked as a hotel cleaner, a cosmetician in a major department store, and a bookseller. But most properly, she has been a journalist/researcher for the Australian Broadcasting Corporation where she met her husband, who was also a journalist, subsequently a media executive, and is now a communications consultant and farmer. Prue writes historical fantasy for which A Thousand Glass Flowers (Book Three of the quartet, The Chronicles of Eirie) received a silver medallion in the 2012 Readers' Favorite Book Awards in the USA. She also writes historical fiction, for which Gisborne: Book of Pawns received an Honourable Mention in the 2012 Golden Claddagh Writing Contest (USA), a 2013 Rone Award (USA) and a 2014 Indie Book Readers' Appreciation Group's gold medallion (USA) and Tobias was a semi-finalist in the M.m.Bennetts Award for Historical Fiction 2016 and has been awarded the prestigious gold medallion by the Indie BRAG (USA). The Huffington Post has done stories on her work and she has been interviewed a number of times by the Australian Broadcasting Corporation. Her historical fiction titles include The Gisborne Trilogy and a new series called The Triptych Chronicle for which Tobias is Book One and Guillaume, Book Two. Tobias escalated to Top 100 with Amazon.co.uk (Biographical Fiction) within a day of being released. Each of her fantasy e-novels ranked unbroken in Amazon.co.uk's Top 100 since publication. She has collaborated in a number of excellent anthologies, including two that raise money for cancer research and she is collaborating with UK writers. SJA Turney and Gordon Doherty in a boxed set of historical fiction titles.